It is not often that one encounters a pair of “semi-identical twins.” In fact, the world has only seen two of cases of this phenomenon ever before in history. While we have all heard of fraternal and identical twins, the term “semi-identical” twins is puzzling. What exactly does that mean? By definition, identical twins are created from a single fertilized egg that eventually splits in two and forms two identical males or two identical females. In this case, they share 100% of their DNA. On the other hand, fraternal twins are created from two fertilized eggs from two of the father’s sperm, producing two genetically unique siblings. They share 50% of their DNA. Interestingly, “semi-identical” twins will share the same identical DNA from one parent, but not from the other. The first pair was born in the United States in 2007. The second pair, although born in 2014, was recently discovered in Australia. The discovery was actually made before the twins were born in 2014. In early pregnancy (at about 6 weeks), a single placenta had indicated that the expectant mother was going to have identical twins; however, an ultrasound at 14 weeks showed the twins were male and female, which would then make it impossible for the pair to in fact be identical. Consequently, doctors determined that a single egg must have been fertilized by two sperm before it divided thus resulting in “semi-identical” twins. 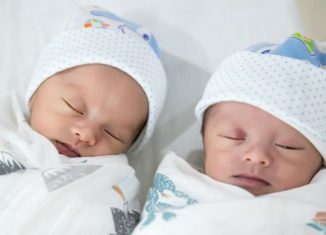 The researchers who were responsible for the discovery of the twins screened approximately 1,000 pairs of fraternal twins to see if this rare occurrence was more common than believed to be. However, no other cases were identified. Typically, when two sperm penetrate one egg, the resulting embryo has three sets of chromosomes leading to an abnormal pregnancy which often ends in miscarriage. In the case of the Australian semi-identical twins, the fertilized egg divided into three sets of chromosomes: DNA from the mother and sperm #1, DNA from the mother and sperm #2, and DNA from sperm #1 and #2. Eventually, the set of sperm-only cells died, while the other two sets containing the mother’s DNA and each of the sperm kept dividing. These twins share 100 percent of maternal genetic material, while they only share an amusing 78 percent of paternal genetic material due to the remaining cells reuniting. The result was a rare set of “semi-identical” twins. Based on this scientific description, it would make sense that the twins share only a proportion rather than 100 percent of the same paternal DNA, while they share all of the mother’s DNA. Most of the time, when this happens, the twins don’t survive. In these two rare cases in the US and Australia, fortunately, both sets of twins survived and continue to thrive!